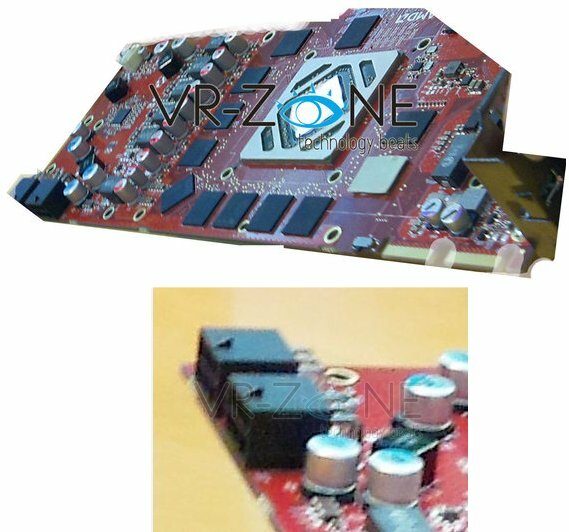 VR Zone got its hands on two more blurry snapshots of what is claimed to be an AMD Radeon HD 7900 series "Tahiti" graphics card. The model seems to have 1.5GB GDDR5 memory, a 384-bit memory bus, dual-bios, and two CrossFire connectors. This card has two 6-pin PCIe power connectors, suggesting this may be the Radeon HD 7950, while the previously leaked photo with 6-pin + 8-pin connector may be a Radeon HD 7970. The card most likely features 1.5 GB GDDR5. The 5+1 phase PWM is also visible. Most importantly, we get the first glimpse of the Tahiti die. It is rotated by 45 degrees and covered by a partial heatspreader. However, the die itself is exposed to the heatsink. Tahiti is a big chip - at first glance a similar size to Cayman. However, it is still visibly much smaller than NVIDIA's previous flagships, GF100/GF110 or GT200/GT200b, so AMD continues to dismiss NVIDIA's big die strategy. There is a crucial difference from the previous leak - this sample consists of 2 x 6-pin PCI-e connectors, as opposed to the 8-pin + 6-pin configuration previously captured. This could suggest that this is either an advanced production ready sample, or Tahiti Pro, or HD 7950, which should feature a lower TDP than Tahiti XT / HD 7970. This card thus has a TDP somewhere between 150W and 225W.